Production standards for film sound recording are fairly universal; whether it is on a major Hollywood lot or an independent location, you will usually find a NAGRA. So it was recently, half way up an Irish mountain with a combined Italian, Irish, British, and French production, a Yugoslavian writer-director, a Spanish resident French sound recordist and a Portuguese resident Yugoslavian sound editor/mixer. Sound recordist Phillippe Faujas chose to use a NAGRA IV-S TC for the six weeks on location in the Wicklow Mountains, filming the surreal comedy "How Harry Became A Tree" with award winning writer-director Goran Paskaljevic. 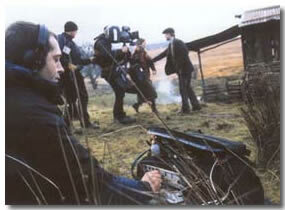 The film was shot entirely on location, in a small purpose-built set of the cottage in which the drama unfolds, in the particularly exposed and inclement conditions on the mountainside. Several factors informed the choice of recording equipment and format, principally, the artistic considerations of the close proximity of the drama and the sheer physical constraints of filming in the cramped cottage. Paskaljevic, Faujas and sound editor/mixer Branko Neskov discussed what was required for this very human story and agreed that the warmth and detail of analog recording was the right option for the compact sound stage. "We needed high definition, a precise and warm sound" explains Faujas. Although no stranger to a multitude of digital recorders, he is in no doubt about the enduring quality of the NAGRA IV. "There is no better sound, it's a simple as that. It is cost effective, reliable and when you're in a remote location you really need a machine you can trust." The lack of space precluding the use of a sound trolley, a Cooper Sound CS104 4-channel mixer offered renowned audio quality in a compact and lightweight combination; "The equipment had to be compact and having it all in one bag was essential. I've been using the Cooper Sound mixer for five years now and I can't fault it in any way. It's the perfect complement to the NAGRA and has a very good sound. I heard about it through recommendation and once I'd used a friend's machine, I quickly realised I would have to use the same combination in future. " "How Harry Became A Tree" stars Colm Meaney, Adrian Dunbar and Cillian Murphy and tells of the surreal lengths to which a man will go in order to remain in control of his ever shrinking corner of the world. The film is produced by Cattleya, Rome with Paradox Pictures, Dublin, Film and General Productions Limited, London and Mact Productions, Paris. The NAGRA IV-S has been going strong since 1971, with many modifications ensuring that the machine meets modern requirements. It is sup- plied with 3 speeds in NAB, CCIR, pilot, non- pilot and time code versions. The Cooper Sound CS104 "over the shoulder" 4-channel mixer features Jensen coupled inputs and outputs, gold plated connectors and switch contacts, selectable phantom and T-power, external or battery power source and the highest quality components delivering the renowned Cooper Sound audio quality with a 20 Hz -20 kHz range.